Submerged vegetation mapping from VHR satellite data. Case Studies in Montenegro and Apulia (Italy). 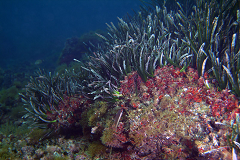 The projects described in the following represent brilliant cases of application of the methodology of analysis of the marine bottom composition, as a support for the environmental monitoring for different purposes. In the first case, the project goal was to give the user an updated indication about the bottom composition in some zones close to the Brindisi and Salento coast, as a support for the environmental impact evaluation of the future underwater pipeline from Azerbaijan to Italy, part of the TAP (Trans-Adriatic Pipeline) project. In the second case, the final objective was to obtain support data for the environmental analysis of the entire Montenegro coast and for the identification of areas suitable for the construction of infrastructures. More specifically, the customers were interested in evaluating, in the areas of interest, by the use of updated satellite data, the presence of Posidonia Oceanica, an important marine vegetable species which can act as an ecosystem protector and as a barrier against coastal erosion. For this reason, the current laws in the environmental protection field have defined Posidonia a natural protected species. The design of coastal and off-shore infrastructures must take into account the presence of this fundamental vegetable species. Thanks to the experience acquired in the field of Earth/Marine Observation in several research projects (MarCoast, AcquaMar), Planetek Italia has made available its technological know-how, supplying services connected with the analysis and the mapping of the submerged vegetation, starting from the visual and automated image interpretation of high resolution images, giving an appreciated contribution to both projects. The satisfying results obtained have allowed to give information capable to orient the off-shore design activities.